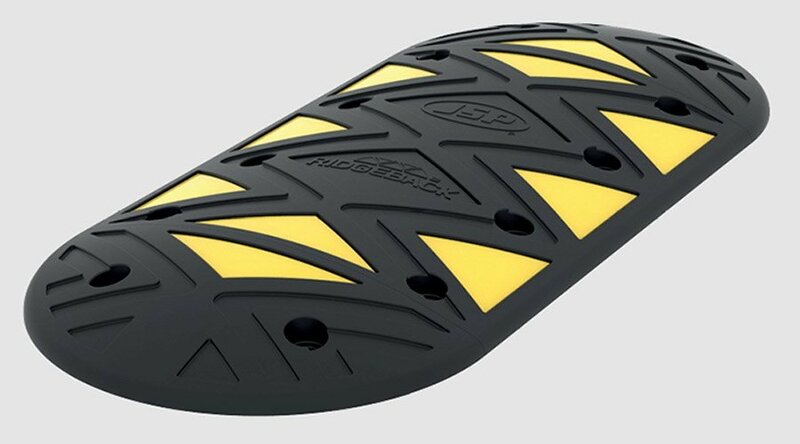 JSP Ridgeback™ Speed Ramp is now in stock! Buy them in bulk or as part of a full traffic management supplies package. It’s incredibly effective by being the most adaptable and highly durable speed ramp on the market. Its distinctive design reduces vehicle speed and improves safety conditions in residential and commercial areas. The angle of the thermoplastic retro-reflective elements optimises interaction with vehicle headlamps and ensures better visibility with glass bead technology. The reflective is also distributed across a wider area compared to traditional styles of ramp. Made from a high performance polymer technology and conforming to requirements of BS EN 1436:2018 and BS EN 1824:201, this speed ramp is perfect for tough conditions. The JSP Ridgeback™ Speed Ramp uses a clever interlocking system for easy connectivity and makes assembly a piece of cake. JSP have also designed a channel on the underside of the end caps to allow safe passage of wires or hoses, protecting them from heavy duty vehicles. Available in multiple options and dimensions, aimed to reduce vehicle speed to a maximum of 10MPH and 5MPH respectively, we now supply the country’s best speed ramp solution. Get in touch with our Highways Equipment division for details and pricing.